There are about 45,000 students enrolled at the University of Catania, the oldest of Sicily: its foundation dates back to 1434, when the king of Spain, Alfonso of Aragon (who was also King Alfonso I of Sicily) authorised the establishment of a Studium generale with the privilege of issuing legally valid academic titles – baccellierati, licenses and degrees – in the four core disciplines of theology, canon and civil law, physical (medical) and joint philosophy, liberal arts (literature), the papal recognition arriving ten years later from Pope Eugene IV. The organization of the teaching is handled today by 17 departments, by the Faculty of Medicine, and by two special didactic units established in the decentralized offices of Ragusa (Modern Languages) and Syracuse (Architecture). A special didactic unit is also the school of excellence “Scuola Superiore di Catania", a higher education centre of the University of Catania conceived in 1998 to select the best young minds and offer them a course of studies including analysis, research and experimentation. Today the university buildings are spread throughout the city, with a contrast between the modern, hi-tech “University City”, and numerous historical buildings in the old city centre. It offers an attractive portfolio of academic titles and is committed in the creation of a “laboratory” where the ancient Mediterranean culture meets the new technologies, in order to offer advanced training experience. Students wishing to take an undergraduate degree will find our university to be a high quality educational institution. Excellent departments and support services are offered throughout all of our university sites in Catania, Syracuse and Ragusa. Here, students may also discover a culturally dynamic environment suitable for growing as students and individuals as well. 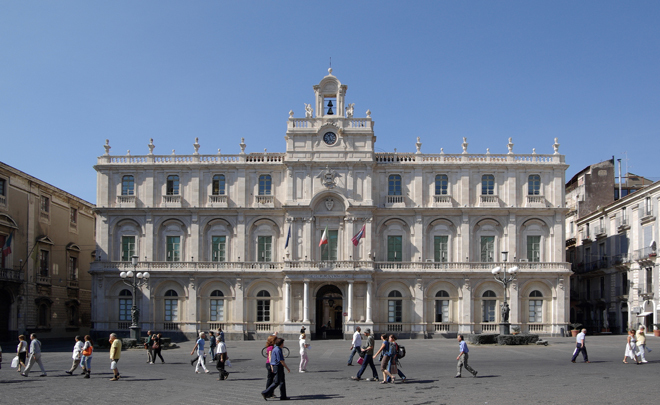 The Department of Political and Social Sciences is located in the antique Palazzo Pedagaggi, an imposing XIX century building in the city center, and with around one hundred professors, research fellows and lecturers, is one of the largest at University of Catania. Founded in 1969, today it runs three undergraduate (BAs), six graduate (MAs) and one PhD courses. Since 2012, as a result of a University reform and reorganization process, DSPS is the only department at UNICT developing research and teaching in the fields of political, historical, social, economic and juridical sciences. DSPS hosts research and study centres covering major topics related to social sciences, ranging from political history to urban history (ISSICO, IMES), from local development (CEDOC), to public policies, institutional actions and services, migration flows (Laposs), from history of migration, especially within the Mediterranean basin (Cosmica), to EU Politics and Policies (Jean Monnet Centre) and Geography research and study (PROGEO). Its library owns 110 thousands books, including reviews. The Department regularly organizes seminars, lectures, and conferences open to all members of the local community. It has a long and qualified experience in EU integration studies and it has been involved in several EU funded Programmes, such as: LLP, ESF, Campus One INTERREG, URBAN, Horizon2020, Erasmus + also in partnership with several Italian and EU Universities or Research Centres. International mobility is a core activity offered by means of Erasmus programme as well as Double Degrees and Framework agreements with EU and International Institutions. Research activities in the Department comprise a wide range of projects, seminars, workshops and conferences in Political and Social Sciences, Economics, Law, History and they lay emphasis on the analysis of political and social change at the national, sub-national, European and transnational levels. Research is often carried out using comparative or contextual approaches to examine and develop wide-ranging areas of research, with a multilevel focus. The research programmes of the Political and Social Science area range over the four sub-disciplines of Comparative Politics, Sociology, International Relations, and Social and Political theory with a long-standing experience in Political Science, International Relations and European Politics. The research programmes in Economics are concentrated in the three broad areas of microeconomics, macroeconomics and statistics and a strong emphasis on International business. The research programmes in Law range over legal issues in areas such as European and International Law, Labour, Economic, Private and Administrative Law. The research projects in History are focused primarily on the History of Europe, from the early modern period to the present, the history of modern institutional systems and the History of the Mediterranean area.